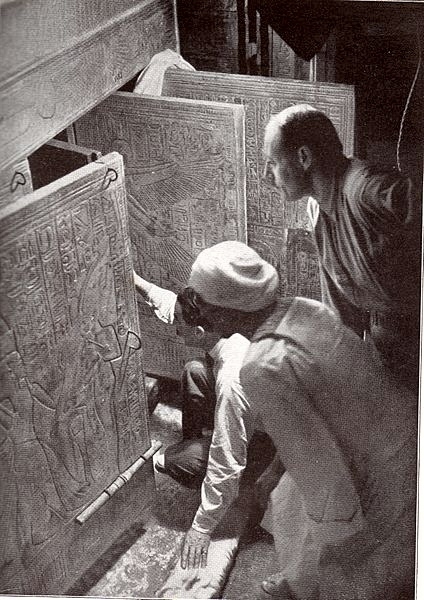 While in the employ of the 5th Earl of Carnarvon, Howard Carter was excavating in the Egyptian Valley of the Kings. On the 4th of November, 1922 he came across a flight of stairs leading down to a blocked door covered in ancient seals. On entering the tomb, on the 26th of November, the body of the boy king Tutankhamun was discovered along with a magnificent quantity of funerary goods. But, as the door of the tomb was broken open, the Curse of the Pharaohs was also released ... well, that's what the likes of Sir Alfred Conan Doyle believed at the time. The first sign of the curse being let loose was when Howard Carter sent a messenger to his house. On approaching the house a small cry was heard and the messenger found a bird cage occupied by a live cobra. Symbolically the cobra was a sign of the Egyptian monarchy. Carter's canary was dead in the cobra's mouth. This incident was reported in the New York Times in December 1922. 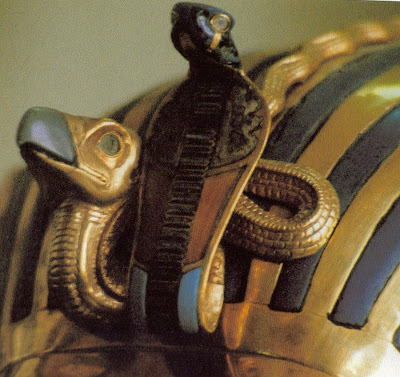 Carter's house had been broken into: by the Royal Cobra as worn on the King's head - see photo above showing the cobra on the brow of Tutankhamun's gold mummy mask. Within seven weeks of the tomb being opened, on the 5th of April 1923, the Earl of Carnarvon died from injuring a mosquito bite. Meanwhile at Highclere Castle in England Susie, his trusty dog, howled and died at exactly the same time. The media quickly embraced the idea of the Curse of the Pharaohs. Conan Doyle, an occultist as well as the Sherlock Holmes author, spread the word. The novelist Mari Corelli warned that there would be dire consequences for anyone entering the previously sealed tomb. People appeared to be falling like flies. Carnarvon's brother Aubrey Herbert died on his way to X-ray the royal mummy; Carter's right hand man, Arthur Mace, died; the American railroad magnate George Jay Gould, who had visited the tomb, died; the French Egyptologist, Georges Benedite, died of a fall after visiting the tomb ... the list went on an on. But was everything as it seemed? Sadly these translations were all fictitious. There were differing opinions as to the reasons for the deaths. Carnarvon, for instance, was already a weak sick man - but some newspapers claimed he had pricked himself with a sharp object - while in the tomb - and this released micro-organisms laid dormant for 3000 years. A Pharaohs curse or not? The Egyptologist Herbert E Winlock compiled a list of more down to earth explanations for each of the deaths. But whose to really say, there are always differing opinions about such subjects. In life there are those who are willing to believe and those who will never believe anything away from the 'normal' way of thinking. An intriguing subject. I didn't realize there were so many deaths following the opening of the tomb. Regardless of the causes, this smacks of synchronicity! Got here from Stumbleupon. Interesting blog and post. May well see you again soon. For me it, is always easier and more beneficial to believe in both the magical and mundane, as they are totally connected. You can't have one without the other.